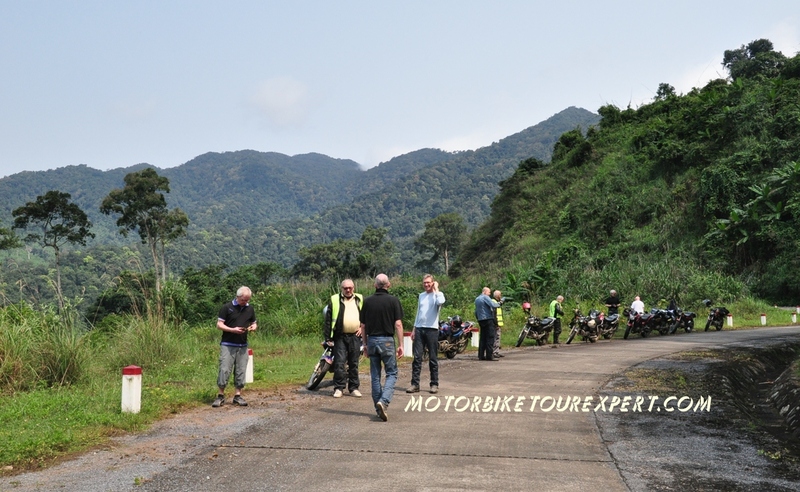 With the length of more than 1000 km and consisting many parts, plenty of the Ho Chi Minh Trail Motorcycle tours are provided by Motorbike tour operators in Vietnam. 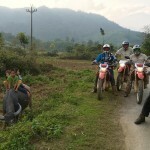 We designed some different itineraries on this trail but this 8 Day motorcycle tour Ho Chi Minh trail is the one we highly recommend because it doesn’t take too long or too short, It is on the most beautiful and quiet part and especially the tour offers a short ride up to the northern mountain area where you can see many different things that you will never see a long the trail. Start the first day at around 9 AM, make the day easy with the start from the western outskirt of Hanoi where the traffic is less busy. We will take small countryside roads to be away from the crazy local traffic, after one hour ride will be in the rural area to the west of Hanoi, the It’s time to enjoy the different Vietnam with the hidden charm from rustic villages. 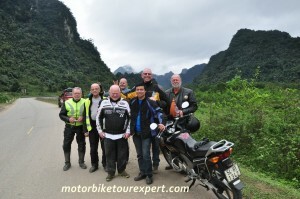 The first day motorcycle tour in Vietnam becomes more and more enjoyable in the afternoon when we get closer and higher up to the mountain area in northern Vietnam. We will be in the peaceful town of Phu Yen – Son La province and end the first day ride at 4:30 PM. Overnight in Hotel. 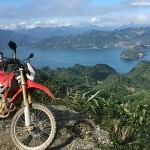 This is an easy and enjoyable ride, After getting out of the town we will ride on the winding roads along the Da river and then up and down ride through mountain passes until Moc Chau plateau where we stop for lunch and then cross the Hua Tat pass – it is also the very old road built by the French so the road is almost empty and offers nice view. Down to Mai Chau at 4.30 PM. Home stay with the Thai people. Start the day with a local coffee and enjoy the view of green mountain and rice fields from the Thai’s stilt house. After breakfast and saying good bye to the peaceful village of Mai Chau, we keep riding on a small, spectacular and paved trail along the Ma river until Cam Thuy town where we stop for lunch. Hit the historical Ho Chi Minh trail and then stay all the way to Tan Ky town where we spend the night in a hotel. Tan Ky is a very small town located in two sides of the Ho Chi Minh road, It is know as the starting point of the Ho Chi Minh trail in north Vietnam where the northern Vietnamese troops start the long trip to the DMZ and south Vietnam, with only some thousands of people this is good chance to experience the daily life of people in remote and quiet area. If we can arrive Phong Nha at around 3:30 PM, we will have a boat trip along the river to some limestone caves. The boat trip takes 2 hours. From Phong Nha, the Ho Chi Minh Trail is divided into 2 branches one in the eastern side and another one is in the western side. Vietnam Motorbike Tour Expert recommends to ride on the western Ho Chi Minh trail. 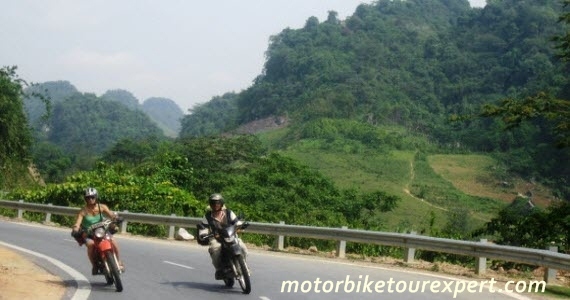 The trail goes through the National park of Phong Nha – Ke Bang, in more than 200 km, you will just see few other motorbikes but a lot of beautiful mountain view. Especially, we will get chance to visit the former US Marine Base with tunnels, Air base and a interesting museum that is newly built. This western Ho Chi Minh trail motorcycle ride is for sure the highlight of the trip. After lunch we will join the high way No 1 and experience the adventure motorcycle ride in the busy traffic. We will be in the beautiful city of Hue at 5. The last day is the easiest day. Instead of riding motorcycle on busy highway No 1, we will get out to the eastern side of Hue city to have more enjoyable motorcycle tour along the coastline, through some fishing villages, coastal roads and cross the famous Hai Van Pass – the most beautiful pass in central Vietnam. The Ho Chi Minh trail motorcycle tour will end in Hoi An at about 4.00 PM, check in the room and say good bye to the Vietnam Motorbike Tour Expert team! Please tell us the kind of bikes you would like to ride and how many people in your group then we will give you the right price of the tour!